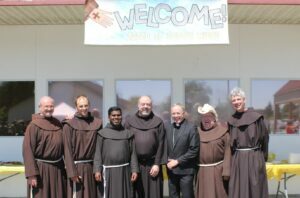 It was with great joy and celebration that the new Franciscan Friars community in Richmond, BC came together on Sunday, 22 July and was officially welcomed by the people of St. Joseph the Worker Parish as their new pastoral team. The celebration of installation and welcome was held during the parish’s 11:15 am mass which was presided by His Grace, the Archbishop of Vancouver Michael Miller, CSB. 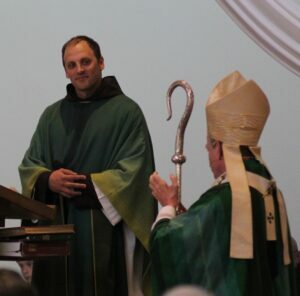 During the installation rite, Archbishop Miller formally installed Friar Pierre Ducharme as Senior Pastor and welcomed Friars Manoj Xalxo, Joe Glaab and Martin Bettin as Assistant Pastors, and Friar Benjamin Ripley as Guardian of the Richmond friar community. Friar Bob Mokry, Minister Provincial of Christ the King Province was also present to celebrate with the community on behalf of the Western Canada friars. The installation rite was very rich in its symbolism that reminded Pierre of his role as shepherd of his parish as stated in the renewal of his ordination promises. Following the Installation mass, everyone enjoyed great food, cheer, and fellowship with a barbecue reception put on by the parishioners. The weather cooperated with a beautiful sunny day. There was a short program where parish representatives gave words of welcome and thanks including: Vila Nova Carvahlo who represented the parishioners; Paul Fraser, Principal of St. Joseph the Worker Parish School; and Stephanie Chua, Minister of the local Secular Franciscan fraternity. Words of thanks and appreciation to the parish community were given by Fr. Bob Mokry on behalf of the Franciscans of Western Canada; Br. Benjamin Ripley on behalf of the Richmond friar community; and Fr. Pierre Ducharme on behalf of the new pastoral team. St. Joseph’s Parish which was founded by our brother Franciscan Friars of the Atonement nearly 70 years ago. It is evident that we as a Friar community have big shoes to fill and look forward to carry on the spirit of St. Francis and journey with our brother and sisters of St. Joseph the Worker Parish. We look forward to our new experiences and embracing the challenges of building a new friar community which come our way. St. Francis, pray for us.